The UFC wasted no time in finding a replacement for the injured Thiago Tavares, as Gleison Tibau will be stepping in to take on lightweight Melvin Guillard at The Ultimate Fighter 9 Finale. The rumor mill was buzzing when reports first surfaced about Tavares’ injury last week. According to MMAJunkie, the UFC will be keeping it all in the family as Tavares’ fellow American Top Teamer gladly accepted the organization’s offer. 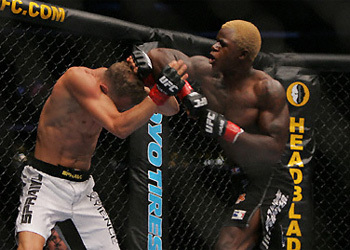 Guillard has fallen on hard times since he appeared as a contestant on “TUF 2,” including a legal beef that found him inside a Houston pen. This will be his first bout since he TKO’d Dennis Siver in 33 seconds last July. The controversial fighter holds a 21-7-2 professional mixed martial arts record. This will be Tibau’s third fight in ’09, and he has been perfect thus far. The Brazilian recently won a unanimous decision over Jeremy Stephens at UFC Fight Night 18. Prior to that, he got Rich Clementi fired from the UFC after he submitted him in the 1stRound of their UFC Fight Night 17 contest. The TUF 9 Finale will be taking place inside the Pearl at the Palms Casino Resort in Las Vegas, Nevada on June 20th.